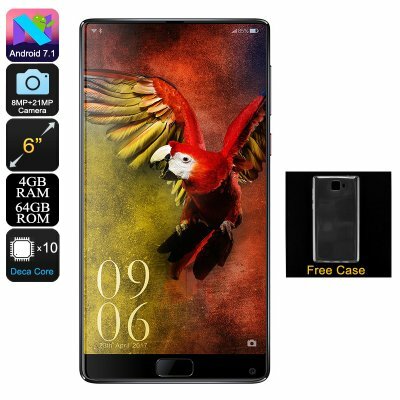 Successfully Added HK Warehouse Elephone S8 Android Phone - Android 7.1, Deca-Core CPU, 4GB RAM, 2K Display, 21MP Camera (Black) to your Shopping Cart. The Elephone S8 Android phone gives us a peek at what the future smartphone industry has to offer. With its exceptionally powerful hardware and latest software, it surely outperforms most other Android phones currently available. Not only does it come with remarkable specs, it also features an affordable price tag – making this cheap Android phone even more attractive. Whether you’re looking for a phone to play games, watch movies, or simply browse the web – the Elephone S8 is sure to meet your demands. With its Dual-IMEI numbers and 4G support, it treats you to ultimate connectivity and keeps you in touch with friends and family no matter where you’re at. On its stunning bezel-less 6-Inch display, the Elephone S8 smartphone treats you to breathtaking 2K visuals. The screen itself has been equipped with Corning Gorilla Glass, making it extremely durable. With this Android phablet in your pocket, you’ll be able to undergo a cinematic experience no matter where you’re at. A powerful 4000mAh battery treats you to an unbelievable usage time of up to 20 hours continuously. This provides you with all the juice needed to get through multiple days of regular smartphone usage. Whenever you’re low on power, you can recharge your cell phone in the blink of an eye thanks to Quick Charge support. Within its sleek body, the Elephone S8 Android phone packs the MediaTek Helio X25 processor. Clocked at 2.5GHz, this Deca-Core CPU is sure to put forth an outstanding performance. Along with the phone’s 4GB RAM, it lets you tackle the most demanding software features without dropping a frame. It furthermore runs on Android 7.1 for an overall smooth user experience. With 64GB interrnal memory, you’ll never have to worry about running out of storage any time soon. This leaves you with plenty of space to keep your files, media, and stunning pictures and 4K video snapped with the phone’s 21MP rear camera. The Elephone S8 Android Phone comes with a 12 months warranty, brought to you by the leader in electronic devices as well as wholesale smartphones..